I think this pound cake would be a lovely dessert to make for a brunch, an afternoon tea or just for a delicious ending to a nice dinner. Since Spring is almost here, fresh blueberries will be in season, but if you want to make this pound cake right now, just use frozen blueberries. It will taste just as good! 1. Preheat oven to 350 degrees ­F/180 degrees C. Generously spray a 9 or 10-inch tube or bundt pan with nonstick spray. 2. Add the sugar to the softened butter, and beat with an electric mixer at high speed until light and fluffy. Beat in the lemon zest. 3. Add the eggs one at a time, beating well after each. 4. Sift together the flour, baking powder, baking soda, and salt into a second bowl. Stir in the blueberries. 5. Mix together the milk,, lemon juice, and extracts. Add the dry and wet mixtures alternately to the butter mixture, beginning and ending with the dry mix. (dry- wet- dry-wet-dry). Stir gently from the bottom of the bowl after each addition - just enough to blend. Try not to overmix and also try to avoid crushing too many of the blueberries in the process. 6. Spread the batter into the prepared pan. Bake in preheated oven for 50 to 60 minutes, or until a sharp knife inserted all the way into the center comes out clean. Allow to cool for at least 20 minutes in the pan, then rap the pan sharply and invert the cake onto a plate. Cool completely before slicing. 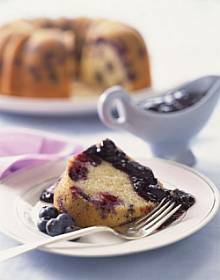 If desired, sprinkle the top with confectioners' sugar and serve with slightly warm Blueberry Compote. Stir water, sugar and juice in saucepan over low heat until sugar dissolves. Add berries; bring to boil. Reduce heat; simmer until mixture thickens slightly, about 2 minutes. Cool slightly. Serve slightly cooled over cooled cake. This Toe Tapping cake was the only topic that our women group fully agreed on. Without a doubt, they all agreed that this was one delicious Toe Tapping cake. Thank you! Made this at Thanksgiving for my favorite uncle. He guarded like his life depended on it. He did not want them to eat it all...lol Thank you again!